Games Reviews | No Chic. Just Geek. The people at Modiphius, makers of the latest Star Trek role-playing game, could be forgiven a slight case of nervousness at the moment. Licenses for these big-name properties don’t come cheap, and they have clearly put a lot of time and effort into the new game. One suspects they may not have been anticipating the underwhelming response to Star Trek Beyond and the general lack of buzz around the golden anniversary of Trek. In terms of the franchise’s future, a lot may be riding on the success of Discovery (perhaps a bit worryingly). There are already plenty of reasons to wish for a renaissance in Star Trek‘s fortunes and quality – the fact this would help the chances of a game which has clearly been something of a labour of love is just one more. I’ve been playing Trek RPGs since the late 1980s – mainly in the form of the original FASA game and its associated starship combat system. Fond of them though I am, the FASA rules were, to the modern eye, very clunky and war-gamey, and failed to address some of the inherent problems in trying to simulate the Trek experience in an RPG: namely, everyone wanted to play a Vulcan, as the racial component of character creation was rather unbalanced, and the issue of the guy playing the captain turning into a despot (or junior characters being wildly insubordinate) was basically left for the GM to deal with. Star Trek Adventures is a much slicker and more modern game that makes a decent attempt at addressing these kinds of issues. There is much to like about it, a little that I am slightly dubious about, and a few things that I think are just a bit odd. First amongst the oddities is the way that the game is clearly being marketed as a (for want of a better word) universal Star Trek RPG, with the option for games set in the 22nd, 23rd, or 24th centuries (or, to put it another way, the Archer, Kirk, and Picard eras). Well, to some extent this is true, but the rulebook makes it clear quite early on that the default setting for the game is the year 2371 (the Enterprise-D is about to go on its final mission, the crew of Deep Space Nine are engaged in their cold war with the Dominion, and the Voyager is preparing for its ill-fated mission to the Badlands). The rationale for this is that there are plenty of options for adventure here, with other ships being called upon to fill in for the lost Enterprise, etc, but it’s hard to shake the impression that this decision was largely made for licensing reasons. The Trek rights situation is rather complex, but basically this game was licensed by the holders of the rights to the TV shows rather than the movies, and so the game’s ability to include material from big-screen Trek seems to be very limited. The art primarily features Picard-era characters (judging by the uniforms), with a few pictures of people in Kirk-era gear, but there’s no sign of the red tunics from the Harve Bennett/Nick Meyer films or the dark uniforms introduced in First Contact. Events from some of the movies are touched upon, but only very occasionally; there’s no mention of the Abrams timeline at all (so it’s not all bad news). The people writing this game really seem to know their lore and be dedicated to providing a proper Star Trek experience for players, so it’s very unlikely that this was an entirely voluntary choice – and, to be fair, I get the sense that Picard-era Trek is still the most popular with the fanbase, and so many people will be looking to play in this era, in which case the late-24th century default setting shouldn’t be too much of a problem. On the other hand, if your game’s setting moves away from about 2370, there’s a sense in which the options the game presents you start to become limited. Several of the PC racial options are designated ‘Next Generation era only’, while there are no ‘original series era only’ choices. It’s most noticeable when it comes to the Federation ship classes presented as player options. Of the nine ships in the book, the Akira, Constellation, Defiant, Galaxy, Intrepid and Nova classes are obviously Next Gen only, while the Miranda and Excelsior classes bridge the original cast movies and the Next Gen era. The only original series ship offered is the Constitution class (to be fair, there aren’t any other canon ship classes from this period). There are no stats for the NX-class starship at all, despite Archer-era play still supposedly being an option. Also absent are stats for the refitted Enterprise, and the Sovereign-class – both of which are essentially movie-only designs. This feels odd and perhaps a little irritating more than anything else, because the basic rules lend themselves equally well to recreating all periods of Trek. Any differences will most likely be ones of emphasis and style, and this is touched on to about the degree you’d expect in a core book – there’s a brief section on how the final frontier was a bit wilder in Kirk’s time (the late 2260s) and how ships operated more independently of Starfleet, but not much when it comes to creating period-authentic scenarios, for instance. The rules themselves are admirably simple, to start with at least, with a roll-some-d20s-and-beat-this-number mechanic. Target numbers vary from 8 to 16, depending on a characters competence (they are based on Attribute + Discipline) with extra successes being generated if you roll well or have an applicable focus (basically, a skill specialisation). The six disciplines each relate to one of the branches of Starfleet and are left admirably vague – the ‘security’ discipline covers everything from interrogating a prisoner to getting into a phaser battle. Characters also have a bunch of talents which can help them in various ways, too. So far so good, but I’m a little dubious about some of the advanced rules the book presents, in which some situations are handled using ‘extended tasks’ with a new set of terminology – the book starts going on about ‘Work Tracks’, ‘Breakthroughs’, and ‘Magnitude’, and even if all this is strictly necessary for a good game experience, I’m not sure the more abstruse elements of the rules are explained sufficiently. At least the book makes it clear they are only advanced options. The system seems likely to work much better when it comes to starship combat (although, as with many of the rules systems, the wise GM will spend time preparing cheat sheets first detailing just what the various options are for the different bridge positions), mainly because many Trek ship battles are basically slugging matches that take a long time to resolve. I anticipate that major battles will feature a lot of battering away at the opposition’s shields, desperate redistribution of the power network, captains yelling orders at their crew, systems being knocked offline, and so on. Although there is also a somewhat streamlined system for when you just want to blow up a Klingon bird-of-prey without a lot of messing about. Hmm, you may be wondering, but what’s the ship’s counsellor doing during these epic starship battles? Just sitting there yelling ‘Captain, I sense hostility’? (If your game group even contains someone interested in playing the counsellor, your players are better adjusted than any I’ve ever met.) And, for that matter, what’s the tactical officer doing while everyone’s trying to cure the Valargian plague and tend to its victims? Well, one fairly bold idea Star Trek Adventures really runs with is the idea of troupe-style play, where everyone runs one main character and has access to a group of minor characters who can be activated as the situation demands it. So, if you really want to be faithful to the TNG vibe and leave the captain on the ship all the time, you can: the guy who runs the captain can play a redshirt or an away team specialist for a while, and if something kicks off on the ship while the away team is, um, away, everyone else can play the bridge crew understudies. These supporting characters can even develop and advance if they recur from one scenario to the next. Given this is basically what happened to Worf and O’Brien on the TV show, this feels ‘right’, and hopefully players will embrace it (it also helps ameliorate the psycho captain problem, as most people will get to be senior officer at least part of the time). Character generation is rather pleasing, though purists will probably object that Vulcans have been left underpowered in the name of game balance – they have the same attribute limits as Humans, which is hardly what the canon suggests. There isn’t the greatest selection of races, but there are guidelines for creating your own, along with unique characters. (Starship creation is similar to PC creation, and it’s quite easy to homebrew your own stats for the NX, or the Sovereign class, or the Ambassador class, or any of the wacky old FASA ships.) You can even randomly create your character for the most part, which is a lovely retro touch – though this does create the possibility of a PC group consisting of four science officers and a helmsman, which could lead to some curious game experiences. Time and again, looking through this book, I was struck by the writers’ obvious and genuine love of Star Trek, both in terms of the lore – details as obscure as the registration numbers of mentioned vessels are correct – and the look and feel of the game. There’s even a roll-your-own-alien-race-of-the-week table, along with a similar one for randomly creating strange new worlds and new civilisations. I suppose the downside of this, when coupled to the fact the game is clearly aimed at existing Trekkies, is that some of the background material assumes familiarity with the universe. A few fewer knowing in-universe documents would have made room for, say, an actual timeline of the Trek universe, detailing what went on and when. But this is a minor quibble – even Wikipedia has one of those these days. 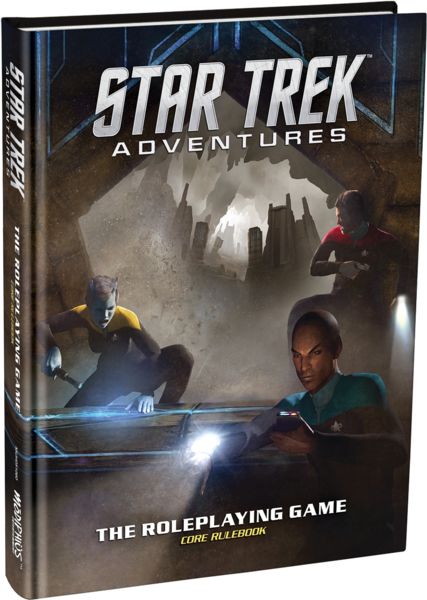 I only have the PDF of Star Trek Adventures, but I am sufficiently impressed with it to be seriously considering acquiring the physical book and pitching it to my current group as something to consider when our current Star Wars game reaches a natural break point. The art is great, the look of the thing is very authentic (although nearly 400 pages of white-on-black LCARS text may lead to eyestrain), and really the only other negative I can think of to say about it is that the starter adventure looks a bit weak. Whether we ever get the ambitious range of quadrant- and section-specific sourcebooks Modiphius have announced, let alone era- or race-specific ones (you just know the Klingon lobby will be demanding this), is still up in the air, but I hope this game does well, because the world could always use more classic Star Trek, and classic Star Trek seems to be baked into the essence of this game. An impressive take on a tough property to get right. Say what you like about the new movie, and I see that many people have, but if nothing else it has certainly succeeded in putting Star Wars back at centre-stage when it comes to popular culture: books, models, DVDs, toys, games, a veritable deluge of the stuff. Now, I feel I should make clear that whatever my attitude to the Disney films and JJ Abrams, my affection for Star Wars in general remains entirely undiminished, which is probably the main reason why I recently checked out Fantasy Flight Games’ Star Wars RPG system. It took a relatively long time for an official Star Wars RPG to come out – 1987 or thereabouts, with WEG’s fondly-remembered D6 system, which I of course bought, along with several of the supplements. I still have good memories of the simplicity of the basic system, which was a welcome step away from the more crunch-heavy percentile- and d20- based games I’d mainly been playing up to that point. And so to the FFG system, which I am reluctant to call a game, singular, as the company have opted to release a triptych of Core Books, each dealing with a different aspect of adventuring in that galaxy far, far away. 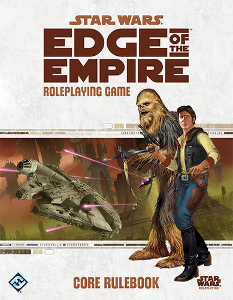 Edge of the Empire focuses on shady doings and underworld life on the fringes and in the dark underbelly of the Empire, with players most likely playing smugglers, bounty hunters, and other equally dubious characters. Age of Rebellion is the book for anyone wanting to play a member of the Rebel Alliance (the default setting for the game is around the time of Episode IV, though I suspect it’s easy enough to adapt for adventuring during the era of the Old Republic, the Clone Wars, or either of the post-Episode VI continuities) – pilots, diplomats, commandos, and so on. 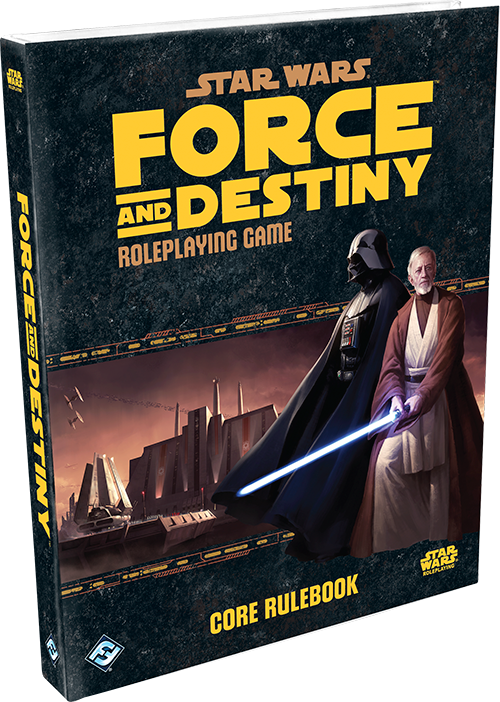 Finally, Force and Destiny is the Jedi-centric book, with players adopting the roles of survivors of Order 66 or other Force-sensitive individuals with a modicum of Jedi training. The first potential brick to be slung in FFG’s direction is the decision to release the above as three hefty (and fairly expensive) 200+ page hardback books, with a fair degree of duplication of material within them, certainly as far as the core rules go. One wonders why they didn’t just produce a single book with just the game rules in it and then three setting-specific sourcebooks, and it’s hard not to conclude that the bottom line is ultimately the overriding concern. I can’t really imagine any group wanting to role-play in the Star Wars universe being entirely happy limiting themselves to playing just scoundrels, or rebels, or Jedi, so purchasing multiple core books is probably going to be a requirement for most groups wanting to run this game. Another potential bone of contention is with the core rules themselves, which use a set of special proprietary dice. Now, to be fair, you don’t actually need to buy these dice: a conversion table for using standard D6s, D8s, D12s is provided (an electronic dice roller is also available on t’internet), but I suspect this would result in an extremely cumbersome gameplay experience until everyone got familiar with the table. Set against this is the undeniable fact that FFG’s system is interesting and fun and potentially very creative for all concerned. The typical resolution mechanic of most RPGs is to roll either a d20, or d100, or some other dice pool, and attempt to beat a specific target number set by the GM. While many games incorporate the possibility of really good or really poor results (or ‘criticals’), this is still essentially a binary-based, succeed or fail, mechanic. The FFG system is anything but binary. When carrying out an action check, you assemble a pool of ‘good’ dice based on your abilities, skills, and favourable conditions, and add to that ‘bad’ dice based on the difficulty of the task and any unfavourable conditions, and roll them all together. 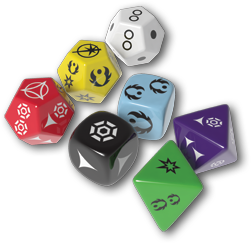 The various good dice generate positive results, called Success, Advantage, and Triumph, and the bad dice generate their opposites, Failure, Threat, and Despair. They key thing is that Success and Failure cancel each other out, as do Advantage and Threat, but your Success does not reduce your level of Threat, nor your Advantage your level of Failure. As a result you can succeed in a task but still generate Threat against yourself, or fail and generate Advantage – it’s not a binary Yes/No system, but one with a huge range of possible Yes, And…/Yes/Yes, But…/No, But…/No/No, And… results. Well, let’s say I roll 2 Successes, 1 Triumph, and 3 Threat (a Yes, But… result). The combined Successes and Triumph are enough to make this a solid hit against the trooper, doing more than enough damage to take him out (individual troopers are relatively puny, so only a single saber hit usually disposes of them). But, and this is something I can’t think of any other system incorporating, I still have those 3 Threat to resolve – I’ve taken out my enemy, but it’s left me at risk somehow, in a manner to be negotiated with the GM. Maybe I’ve left myself open to an attack from one of my opponent’s allies (granting them a Boost die on their next attack check), or the rigours of combat are wearing down my resolve (reducing my reserve of what are called ‘strain’ but are essentially kind of non-lethal hit points). I’ve seen it suggested that there are essentially 18 possible results of any dice check in the FFG system, but even this seems to me to be ignoring the fact that the degree of Success, Advantage, etc, generated is also an issue. Generate enough Advantage and you can activate the special features of your weapon (using a lightsaber to sunder an opponent’s weapon, using the linked laser cannon on an X-wing to hit multiple times from one check, and so on), for instance. I suppose the rules are hackable into something more traditional using regular dice, but it would be an extensive hack and lose much of the charm and potential of the system – and if you were sufficiently unimpressed with the FFG system to do that, I suspect it would be simpler just to use the WEG rules (for instance). Apart from the central resolution mechanic, the rest of the game seems like a fairly solid system, with perhaps a touch more crunch than I personally like in the rules that I use. Character creation is fairly straightforward – you choose a race, a career, and a specialisation for your character, and invest a number of starting experience points (XP) to bring them on a bit before the game starts. Many of the obvious Star Wars alien races are covered in the different core books (Wookiees, Rodians, Mon Cal, Twi’Lek, Zabraks, and so on – no sign of Gungans or Ewoks so far, shockingly), along with a few rather more obscure ones, especially in the supplements (yes, you can play a Hutt, if you really want to). (Droids also count as a playable ‘race’ for game purproses.) As someone who would want his Star Wars RPG to actually resemble Star Wars (which is, after all, humanocentric), I’m not sure how I would head off the possibility of the entirely non-Human party, short of putting an outright ban on non-human Player Characters except by GM consent. Perhaps giving human PCs substantial bonus starting XP and well-played alien PCs bonus in-game XPs would be a possible solution, but here we’re drifting on to one of my personal bugbears when it comes to RPGs, so let’s move on. 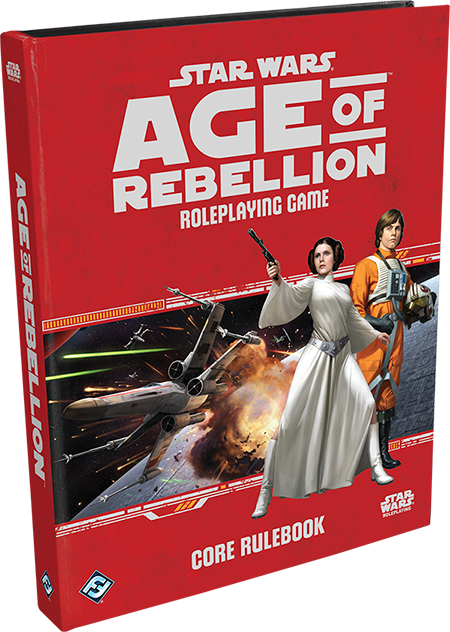 Each core book provides half-a-dozen careers for characters – so Edge of the Empire characters can be bounty hunters or smugglers, for instance, Rebel characters can be aces or commandos, and Jedi can be guardians, sentinels, mystics, and so on. Each career is further broken down into three specialisations – so, for instance, a smuggler could be a pilot, a scoundrel or a thief. Each specialisation has a number of special abilities tied to it which can be purchased in-game, along with a set of skills. Fifty-four starting specialisations covers a lot of territory, with more available in the various supplements, so there’s no shortage of possible character types. Characters can belong to more than one specialisation, too, not necessarily from the same career (though this is more expensive) – so if you want to play a fallen Jedi Makashi duelist from Force and Destiny, turned underworld enforcer from Edge of the Empire (there’s a potentially terrifying melee combatant…), you can – GM permitting, as usual. There is, inevitably, quite a lot of crunch to negotiate here, with the commensurate risk of the spectre of D&Dthink manifesting itself and endless discussions as to the best talent and career options ensuing, but I suppose this is all a question of play style, and discreet game-management by the GM should keep this sort of thing to a minimum. Overall, I would say number-crunching and rules are kept to reasonable levels, except perhaps in the section on equipment, which seem to assume every weapon and vehicle possessed by players is going to get heavily modified fairly quickly. Rules for the Force are, inevitably, most detailed in the Force and Destiny books, but again they are not excessively complex and mesh well with the narrative/cinematic style of the game. If you are running a composite game, there’s the question of how to handle the tricky issue of a character’s relationship with the Dark Side – this is fairly central to Force and Destiny, as you’d expect, but the other core books skip over it. Moving on from the actual system, the books themselves are extremely handsomely presented pieces of work, stuffed with lovely and evocative pieces of art, and equally evocative text pieces introducing parts of the Star Wars universe that people only familiar with the movies may not know that much about. I’m going to go off on a bit of a tangent here and just take a moment to praise, and indeed marvel at, the consistency and coherence of the way the Star Wars universe has been presented in other media over the years. Given the rather ramshackle development of the fictional universes of most comic book companies, or that of Star Trek or Doctor Who, LFL’s devotion to incorporating as much as possible into their canon is – or was – hugely impressive. I picked up The Imperial Handbook recently (published this year), which in addition to being completely compatible and consistent with 27-year-old sources such as the old WEG Star Wars Sourcebook, also has a go at including things originally existing as slightly dubious models in the old Kenner toy line. The quantity and quality of detail is almost irresistibly convincing – to the point where you really feel the pain of those hard-core fans outraged by having many years of post-Episode VI ‘history’ – the Yuuzhan Vong invasion, the fall of Darth Caedus, and so on – obliterated to make way for the Disney incarnation of Star Wars. In short, there’s a wealth of detailed setting material – places, people, races, history – freely available on sites like Wookiepedia, most of which can easily be interpreted in game terms for the FFG system. Added to the immense popularity of Star Wars in general, the result is an almost uniquely appealing setting for an RPG. Whether this is the ideal set of rules to exploit that is another question, but the system is an innovative and imaginative one, and one I’m looking forward to giving a proper try in the not too distant future. As I said when I was writing about the core rules last week, Numenera looks almost deceptively rules-light, but the getting the tone of the stories to the right level of evocative weirdness is still quite tricky. Given how easy it is to cook up your own creatures for the game (pick a number from 1 to 10 – or, more sensibly, roll 1d6+1 – and then tweak to taste) The Ninth World Bestiary might look like a fairly unnecessary purchase, from a rules point of view. It probably is, but in terms of the setting it is a genuinely remarkable resource. On the face of it it looks like a pretty standard RPG sourcebook or monster manual, albeit one realised to MCG’s soaringly high standards of artwork and general production competence. There’s a nice introduction crediting inspirations (most of the collected works of Dougal Dixon are mentioned, but not After Man, oddly enough), then an expanded section on creature design, and then a piece on the ecology of the Ninth World and very brief listings of common mounts, beasts of burden, and other domesticated beasties. The monster manual resemblance hits a definite peak with the appearance of two pages of random encounter charts, broken down by terrain type. Fun though these are, I sort of wonder what they’re doing here, as they do feel like they’d be more at home in a sandbox-procedural style game than a narrative-based one like Numenera is supposed to be – creature ratings aren’t listed here, and don’t seem to have been a consideration, so I can imagine an unwitting first-time GM rolling up a dark fathom (an implacable humanoid engine of utter obliteration with a black hole (literally) where its insides should be) for a random encounter and accidentally TPKing the whole group. Still, I can’t pass by a random table without wanting to rattle some dice at it, so this is just a time-sink rather than a waste of space. Then we are on to the creatures themselves, which are divided into three sections: general creatures, generic NPCs, and specific individuals. There are over 130 all told, mostly of the first type, and all very much of a piece with the general setting. To return to my frequent theme of ‘reasons why I have issues with D&D/Pathfinder’, I used to have difficulty getting my head round a world where people spend two hours walking through villages and farmland surrounded by very mundane sheep, horses, dogs, crows, and geese, then wander a short distance into the woods and find themselves beset by six-legged tentacle panthers with magical powers. 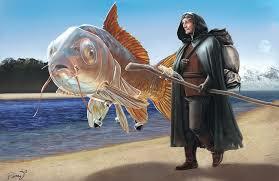 Shouldn’t the magical nature of the setting have an impact on every living thing in it? Shouldn’t all the fruit trees and farm animals be a bit peculiar too? As you can perhaps see, this isn’t just a collection of things for PCs to hack to pieces (though there are plenty of those, too) – along with the odlarks, the book also features calyptors (buffalo-like herd animals which usually produce music but have other acoustic powers), valma (flying purple tetrahedrons that want to be characters’ best friend but turn vicious if snubbed) and shanu (tiny herbivores that imprint on another creature and buff its abilities). These sort of creatures are a godsend for anyone not really wanting to run Numenera as another exercise in Murder Vagrancy: and especially useful are sections for each creature indicating its usual motive and how a group might interact with it. Now, of course, there are plenty of things in this book for which the listed motive is ‘hungers for flesh’, and things which are primarily there to be fought make up a fair proportion of the book – but even these are a very varied bunch, in terms of habitat, power level, nature (there are abhumans, animalistic predators, automata, extra-dimensional creatures, and more besides), and special powers. Pretty much every Numenera creature has some sort of gimmick even beyond its (usually) freakish appearance – even the animals are really animals with super-powers: virtually everything can turn invisible, or release paralysing spines, or pass through solid matter, or morph into a copy of you (probably by eating your face first). This has certainly encouraged me to make the creatures I create for my own games a bit more distinctive and unpredictable. It’s slightly ironic that this book should be so useful in terms of inspiring players’ own creativity, when the sheer quantity of creatures and ideas within means you could probably play for a very long time using just the beasties here and the ones from the core rulebook. It really is inspirational stuff, not least because of the artwork (the vast majority of creatures get a picture, usually full-colour) and the quality of the actual writing. Apart from at the start of the book, most of the background descriptions and game detail are written from an in-universe point of view, although very rarely a subtly tongue-in-cheek note creeps in (the entry for titanothaurs, a class of destructive gargantuan creatures clearly inspired by Japanese kaiju movies, notes their remarkable talent for hiding after a rampage, and lists their habitat as ‘usually near communities containing many high structures’). 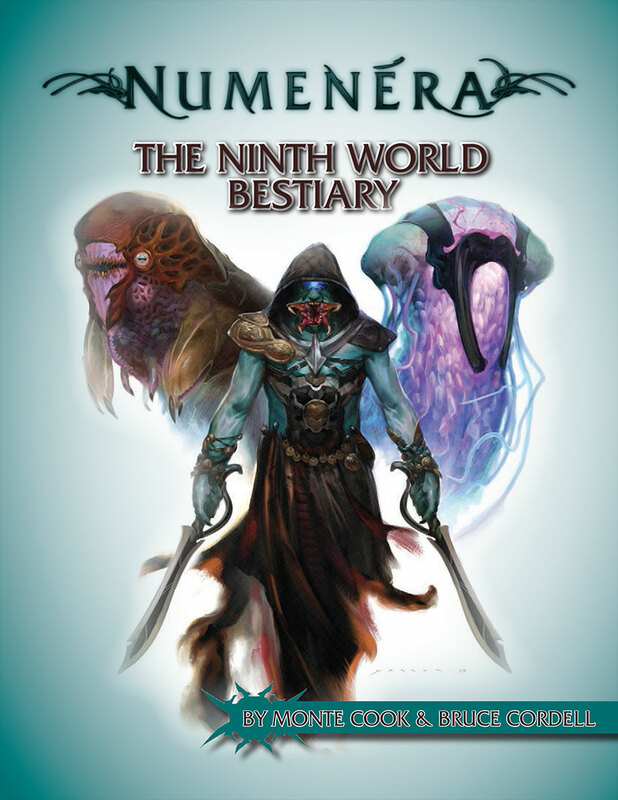 The Ninth World Bestiary makes a remarkable success of combining the venerable and well-loved RPG bestiary tradition with being a brilliant resource for the specific game it was created to support. And, I can’t say this too often, it’s a gorgeously produced book even just as a book: I’ve owned my copy for a couple of months and I can still spend ages browsing through it (and seemingly finding new monsters in it every time, which is not-inappropriately odd). 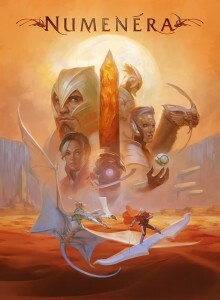 Even so, I suspect anyone reading this book for any length of time will find the urge to play Numenera itself very hard to ignore. I suppose I was using D&D as a shorthand for RPGing or storygaming in general, not least because people who’ve absolutely no idea what The World of Synnibarr or even Vampire: the Masquerade is are still aware of D&D (although their preconceptions may well be wildly inaccurate). D&D is to roleplaying what Hoovers are to vacuum cleaners. I mention this because I don’t think I’ve actually played any version of D&D in nearly 25 years, although some storygaming has taken place in that time: a couple of swings at the slightly byzantine FASA Doctor Who ruleset, a surprisingly rewarding Palladium-rules campaign where all the characters were mutant animal vigilantes, a couple of stabs at playing Call of Cthulhu, and – last but very much not least – an eight-month Vampire chronicle in 1995 and 1996, during which made friends I have kept to this day. Since then, however, nothing much except for an abortive attempt at playing Werewolf over ten years ago. Hasn’t stopped me wanting to participate in this kind ofstorytelling, though, nor has it stopped me keeping up with rulesets that particularly interest me: the original World of Darkness, because the setting is so extraordinary; supers systems, because I’m a comics fan; licensed Doctor Who games, because duh; and generic fantasy systems like D&D and its close relation Pathfinder, because in many ways this is the ur-RPG, the purest example of the form. Yet I’ve always had issues with D&D in its classic form, which may be the reason why I haven’t played or run it since 1990. One of these is really the sheer crunchiness of the rules – it would take a long time to teach a new player D&D 3.5 or Pathfinder, and the rules seem to promote a tactical wargame approach to play. The other is to do with the nature of the game and the setting itself. The default D&D setting is derived from classic fantasy, most obviously the works of Tolkien and Robert E Howard, and the fact that the game is 40 years old means that most players don’t just have a good idea what the difference between a dwarf and an elf is, they also know in some detail the capabilities of even reasonably obscure monsters like slaad and yuan-ti. The result is that the game becomes less about mystery and tension and more about number crunching and – again – tactical wargaming. I also have problems with finding the default setting a bit implausible, especially after having read books like Jared Diamond’s Guns, Germs and Steel: where are all the orcs and kobolds getting their weapons from? What’s their food supply? If they’re just nomadic raiders, they must only have a relatively tiny population, so why don’t the civilised races just wipe them out? To say nothing of coming up with an explanation of why all orcs are inherently evil. Even beyond that, most settings ignore the dire mammoth in the room: why is the landscape studded with vast dungeons full of useful, dangerous stuff? None of these are insuperable problems, provided you’re prepared to put the time in, but sometimes you can’t or don’t want to. However, I think I have found an alternative, a game intriguing enough to make me put in the effort and organise my first game session in over a decade. The system in question is Numenera, from Monte Cook Games, and it honestly reads like an attempt to address my specific problems with D&D while retaining everything which makes the concept of the game attractive. The setting of the game is post-apocalyptic – or perhaps I should say it’s post-post-post-post-post-post-post-post-apocalyptic, for the citizens of the setting generally agree that eight previous civilisations have risen to unimaginable heights and plunged back down into nothing, leaving only mysterious relics as signs of their existence. These relics include megastructures, bioengineered creatures, dimensional rifts, machine intelligences, and much more besides. The ‘native’ human civilisations of the Ninth World operate at about the level of Dark Ages Europe, but there are those amongst the people who make it their mission to explore the vestiges of these previous realms, whether that be for profit, knowledge, or power. These, of course, are the player characters. The genius of this setting, if you ask me, is in the way it allows the storyteller to comprehensively re-skin all the classic tropes of fantasy rolegaming, restoring a sense of mystery and wonder to them while still leaving them intuitively familiar. Every seasoned rolegamer knows orcs as well as their own family, knows what to expect, know roughly how hard they hit, and so on: but when a mob of twisted abhuman creatures with tentacles for heads comes boiling out of the woods around you, that’s a different matter – what the hell are these things? What are they capable of? The potential for metagaming – which even the best of us can find hard to resist – is vastly reduced. It would be remiss of me not to mention, by the way, that the setting as presented in the Numenera core book isn’t just imaginatively conceived, but worked out in some detail: there are nearly a hundred full-colour pages just describing the places of the setting, mostly in story terms, to say nothing of many more outlining a representative selection of monsters and ultratech gadgets (the setting equivalent of magic items). This is a genuinely exciting setting – at least it is if, like me, your taste in science fantasy takes in Tolkien and Howard and goes on to include the likes of H.P. Lovecraft, Michael Moorcock, and Olaf Stapledon – and the whole book is a thing of beauty even if you never actually get around to playing the game itself. This would be a shame, because as Monte Cook himself says, he believes his company produces books that are fun to read and look beautiful, but they’re really intended to be played – they’re ultimately games, after all. The ruleset of Numenera reads like a passion project, Monte Cook’s attempt to put everything he believes about storygame design into a single system. Even character creation is about a 15-minute job, as players just fill in blanks in a I am a [adjective] [noun] who [verb]s sentence and make a few other minor choices. The game looks like it has classes – glaive (essentially a fighter), jack (utility character), and nano (technomagic user), but there’s still a lot of flexibility built into this. So you can play a Rugged Glaive Who Hunts With Great Skill, or an Entertaining Nano Who Bears A Halo Of Fire, or a Graceful Jack Who Carries A Quiver. A good selection of character choices come with the core book, but it’s actually very easy to customise your own – working out rules for an Obsessive Jack Who Walks In Shadow should be pretty easy once you get familiar with the system. Now, my usual practice when picking up a new RPG is to make up a load of sample characters and let them fight each other (with some systems I never seem to get any further, to be honest), but another unique thing is that it has an assymmetrical game system. Player characters are defined by half-a-dozen numbers, but monsters and NPCs usually have only two or three: in extremis, you can assign any given creature a rating between 1 (a slightly asthmatic rat) and 10 (Great Cthulhu in one of his moods) and literally take it from there: every other key stat derives from the initial rating. This, by the way, means there’s no reason why Numenera players should ever find themselves going ‘Hey ho, another band of grush marauders – where did we put the axes?’ in the same way that D&D veterans treat kobolds and hobgoblins as reassuringly familiar old friends. 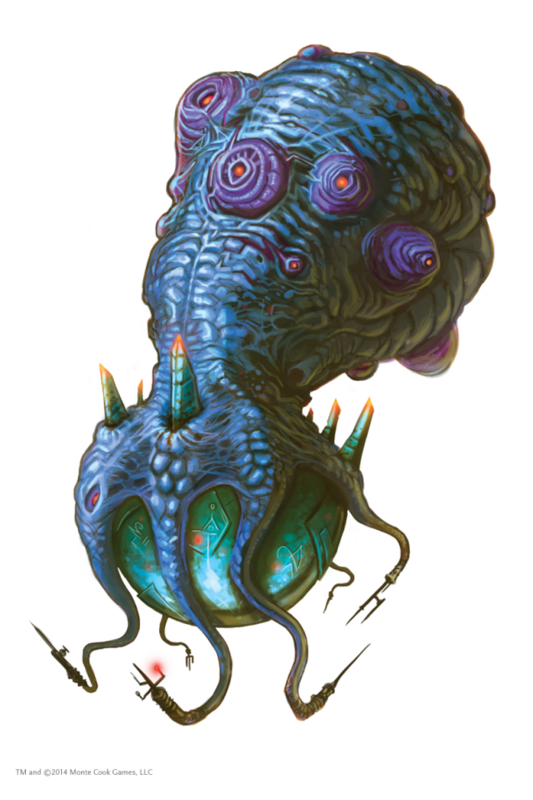 Creating new D&D monsters can feel like time-consuming maths homework; creating Numenera monsters is a breeze. Now, while the core rules of Numenera are almost uncannily brief, there’s a lot of guidance and optional extras also included. It took me a while to get through this, mainly because other parts of the book are just so enticing, but this meant I missed a couple of key things which would have answered some of my misgivings about the game. I did wonder what would happen if there was a PC vs PC clash, given the nature of the system, or indeed for that matter an NPC vs NPC confrontation. Well, these are addressed, of course. I’m still a little uncertain that the players-roll-all-dice rule should be as definitive as the book suggests. Let’s say the players are trying to cross a river and find a rickety old bridge, and they ask me as GM whether it looks like it will take their weight. Now, I know it probably won’t. What happens if the players roll and fail their perception check? No matter what I say, they’re not going to get onto that bridge in the same way they would if I’d rolled the dice and hidden the result: they are metagaming again, and understandably. Even as I think about this, though, it occurs to me that Monte Cook (I hate to keep calling him that, but ‘Monte’ is just too overfamiliar, ‘Cook’ is too disrespectful, and ‘Mr Cook’ is too formal) has found a smart answer to this too: there’s another mechanic where the storyteller gets to stick his nose into the story and say ‘suddenly, the bridge collapses’ in exchange for giving the poor devil who’s now falling into the river some extra experience points. There’s a sense in which this formalises something a lot of GMs have been doing unofficially for decades anyway, and it’s all in aid of a good story, which is one of the guiding principles of Numenera. The designer (that one’s too impersonal, I fear) goes into much detail about this in the section on actually running the game, which must be one of the best I’ve ever read: there isn’t just advice on adjudicating the rules and the underlying principles (logic, creativity, flexibility), there’s a section on the GM’s rule as mediator of the setting in terms of establishing mood and so on, which even extends to things like choice of diction. It’s almost like a thesis on storygame design and RPG refereeing, and an extremely good one. Perhaps a little more advice on scenario design would have been ideal – the book recommends avoiding the traditional map-based dungeon crawl scenario, but is a little vague on how to design and run a map-free dungeon crawl, or indeed another style of adventure, especially given that Numenera is in theory an exploration-centric game and I suspect some groups may default back into D&D-style Murder Hobo mode without even realising it. On the other hand, the core book includes a selection of different styles of adventure (one of them is, ironically, a map-based dungeon crawl) and these seem pretty solid. Not that I will be using them myself, partly because I want something quicker and more straightforward, partly because I’m always wary of the problems inherent in running a scenario the players have access to. 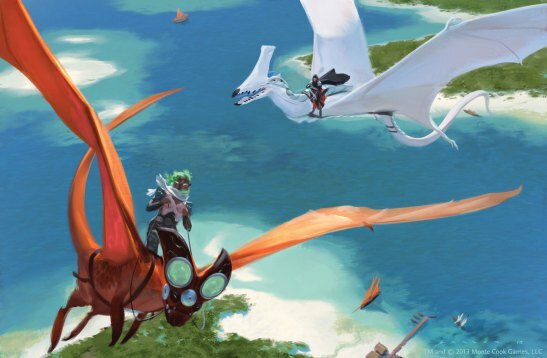 Normally I would feel a little uncertain heading into a new game with a new system and new players, not to mention my first time playing a game over the internet: but Numenera seems enough in sync with my own ideas about storygaming, and a strong enough system and setting, for these not to be real issues. This game looks very much like an instant classic, even just considering the core rulebook (the supplements I’ve seen all maintain the same standards). My main worry is not that the rules are not up to scratch, but that my GMing skills are so rusty I may not able to do Numenera justice. That should tell you something about just how impressed I am by it: it’s a completely new and in some ways almost radical system and setting, but it also somehow feels like it contains the essence of every reason why people have been playing storygames since the 1970s. Having recently come to terms with the fact that I am now more likely than not an ex-Games Workshop wargamer, I find my attention sliding back to the pen-and-paper role-playing games which were really the source of this particular interest. Truth be told, my active career as an active roleplayer didn’t last much more than a decade, but I have spent a significant chunk of time since then buying, comparing, and mulling over different games and systems. 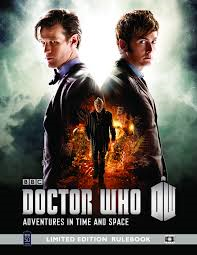 As I mentioned recently, I have picked up PDFs of Cubicle 7’s Doctor Who: Adventures in Time and Space game. To say I am rather impressed is possibly an understatement: certainly, all the things that are good about it have made me reconsider the strengths and weaknesses of the games I’ve played in the past. Doctor Who hasn’t been quite the natural fit for storygaming that you might expect, given the imaginative, adventurous basis of the series. AITAS is the third attempt at an official RPG. The last one was Time Lord, written by Ian Marsh and released over 20 years ago by Virgin. The system was simple enough, if a bit bland, but the game had the misfortune of coming out just as the TV show got cancelled, so interest was minimal and it received scant published support (although it does hold the distinction of having had an adventure published for it in DWM). Rather more significant, if divisive, is the game published by the American company FASA in the mid 1980s. This was a proper game line, consisting of the basic rules set, half a dozen or so somewhat variable adventures, and some pretty solid sourcebook sets for the Master, the Daleks, and the Cybermen. I played this game a lot in the late 80s and early 90s and had some good times doing so, but on reflection this was probably more in spite of the actual rules than because of them. The FASA rules, like a lot of RPG systems from the 70s and 80s, really betray roleplaying’s origins as an offshoot from more traditional wargaming. Most of these really left the actual roleplaying up to the players, to the point where it was an optional extra: rules systems were almost exclusively concerned with tactical combat and (sometimes) skills use. More than a few early-ish games were not much more than skirmish wargames with advancement and reward systems bolted on. Some of these games were also very narrative-neutral: ‘classic’-style D&D, after all, basically concerns a team of violent specialists exploring a maze, (probably) killing every creature they meet, and nicking all their stuff. The FASA game at least emphasised the importance of narrative, but the rules also included a bizarrely complex tactical action system and numerous pages of weapon statistics and critical hit and miss tables. The system was authentic to the TV series up to a point, in that combat was unusually lethal by most RPG standards: most player characters could take 20-30 points of damage before dying, but energy weapons could easily deliver double that from a single hit. But it always seemed to me that the system presupposed violent solutions to adventure challenges (indeed, one section giving tips on designing scenarios featuring the Cybermen stressed the importance of including a source of gold in every adventure, so the player group could beat them in combat). Coupled to a hugely detailed and somewhat unwieldy skill system, the result was a game which played well enough but didn’t exactly encourage a style much in keeping with the TV series: more for roleplaying gamers than Who fans. On the other hand, one of the first things you sense about Adventures in Time and Space – yes, we have reached it at last – is that it seems to have been made in the hope it will be purchased by at least as many young Who fans as grizzled old rolegamers, for a familiarity with the Doctor Who mythos is taken for granted, while a willingness to spend hours learning rules is not. While there are subtle nods to the FASA game in the text, the rules set is much simpler and more accessible. Characters are defined by six basic attributes (things like Strength, Presence, Co-ordination), which are rated from 1 to 6 (usually; aliens can go higher), twelve skills (very broadly defined – they have names like Technology, Knowledge, though you can specialise if you choose), and a selection of Traits which modify your abilities – such as Attractive, which gives you a bonus when being persuasive, or Boffin, which allows you to create new gadgets on the fly. Characters also get something called Story Points, to which I shall return presently. The basic system is dead simple: the storyteller assigns any challenge a difficulty (the default is 12) and the player rolls two dice, adding the appropriate attributes, skills, and trait modifiers. (For example – trying to work out which Roman Emperor you’ve just been dragged in front of? That’d be Awareness + Knowledge, probably. Trying to fly your TARDIS through an asteroid field at high velocity? Co-ordination + Vehicles. Shooting at a box of gelignite to sabotage a missile some robots are constructing? Co-ordination + Marksman, and so on.) There are a few more wrinkles but that’s basically it. The result is a system you can teach a newbie player in well under five minutes. I suspect that even the best-prepared FASA GM would struggle to lead a small group of players through character generation in much less than hour; a well-prepared storyteller could take players through the same process for AITAS in fifteen to twenty minutes. I think the importance of this is easy to underestimate: it’s hard for players to get invested in a game where they don’t really feel that they understand the rules, and didn’t shape their character themselves. It’s a fast-playing, almost free-form system, which seems to me to be very far from the wargamey origins of mainstream RPGs. This is only consolidated by the game’s approach to combat, which is to strongly discourage it. Emulating the spirit and style of Doctor Who is built into the system itself, which is novel: the rules actually include a section entitled Guns are Bad, containing a number of suggestions on how to actively avoid combat. Even if you wanted to run a combat-heavy game – everyone as UNIT or Torchwood operatives, perhaps – you might need to mod the rules quite considerably: Initiative is organised so aggressive combat actions almost always happen last (trigger-happy types like K9 or the Brigadier have traits allowing them to ‘jump the queue’, so to speak), usually giving characters a chance to do something clever and non-violent (or just run away) first, while the systems for recording damage are vague and quite subjective, though also occasionally innovative: you can resolve arguments by damaging an opponent’s Resolve until they give up and concede to you (at which point their Resolve resets). Many weapons have a damage characteristic of ‘L’, meaning they are instantly lethal, no questions asked. Confession time: I haven’t actually sat down and played this game with other people yet. But I suspect that when I do (and I hope it is ‘when’ rather than ‘if’), it will feel much more like telling a collaborative story and a lot less like something which is second-cousin to a wargame. To this extent I think it is remarkably faithful to the show it is trying to emulate and evoke. That said, whether you’re dealing with veteran rolegamers or newbie Who-fans, human nature remains the same, and the basic set as written may throw up a few problems. While the game does offer suggestions for scenario set-ups with everyone playing humans (Torchwood teams, spaceship crews, UNIT, etc), the default assumption is that players will be taking on the roles of the Doctor and other TV companions (stats from the 21st century series are provided with the PDF currently available). This seems fair enough, as Doctor Who without Time Lords and TARDISes isn’t really Doctor Who. To its credit, the game offers suggestions on how to deal with the inevitable resulting squabble over who gets to play who (or indeed Who), but my instinct is to avoid letting people play TV characters anyway. In any case, other products in the game line have come up with expanded rules for creating player character Time Lords, which solves this problem to some extent: the main problem is one of the current mythos, in which Time Lords are notably thin on the ground. I think using different levels of SPs partly solves the problem of differing power-levels; the rest of it can probably be dealt with by careful character design (ensuring a degree of ‘niche protection’, where everyone has a ring-fenced area of expertise), and setting your game pre-Time War or in an alternative timeline, or coming up with some other creative solution (Gallifrey finally gets out of that frozen dimension – or at least one TARDIS and its occupant does). I’m slightly dubious about the adventures included in the version of the game I acquired, as they don’t feel especially Who-ish to me, but on the whole this is seems like a fun, easy-to-grasp gateway RPG, written in an engaging style and with some lovely touches that reflect the style of the series. So many peripheral Doctor Who-related items just take themselves very seriously indeed, but parts of AITAS are much more laid back. You can give your character the rather politically-incorrect Screamer! trait (perfect for those old-school companions), giving you the option of temporarily stunning an oncoming monster with the sound of your shrieks, provided you use your next action to run like hell. (Other traits which old-school fans might especially appreciate include Five Rounds Rapid! and Reverse the Polarity of the Neutron Flow.) Equally, rather than having your character mown down in combat when you run out of SPs, you can ‘borrow’ SPs from the storyteller to save yourself, as long as you also take the Unadventurous trait – the catch being that if you take it three times, your character gets so fed up of the perils of time travel they leave the TARDIS at the end of the current story. The ethos and style of Doctor Who – freewheeling, combat-averse, story-friendly – are deeply woven into the system here, and I was rather surprised to learn this same game engine has been used as the basis of a couple of other product lines: a RPG based on Primeval (released just about the time the TV show was expiring, hey ho) and a pulp SF game called Rocket Age (which I’m rather tempted to buy just on the strength of the premise). Personally, games which are more about story and less about crunchy combat rather appeal to me, but I’m aware others might feel differently. Certainly some play-styles would not be supported by this game: if you want to play combat-heavy dungeon-crawls in Who-world, you should probably look elsewhere. But if you are looking for a licensed RPG which really works hard to encourage players to emulate the tone and style of its source material, and of course you want to tell your own Doctor Who stories with your friends and family, you could do very much worse than this. As promised/threatened, a more in-depth look at Cubicle 7’s Fourth Doctor Sourcebook. This is a game aid for their Doctor Who-themed Adventures in Time and Space storytelling game (or RPG, if you prefer). It does occur to me that if I’m going to start looking at this particular line of products, I should probably start with the core rules themselves, but to be honest, as I write I’m still assimilating them. The core rules started off by assuming a – for want of a better word – ‘present day’ setting for the game, with David Tennant’s incarnation the default Doctor (the game was released in 2008). This is part of a line of books covering more of the series’ history. The approach they’ve taken is interesting, to say the least. There are all the things you might expect from a fourth Doctor themed-book, starting with detailed stats for the man himself and his significant companions. Some amusing new era-specific traits are included – I particularly enjoyed ‘Sesquipedalian‘, reflecting a character’s tendency to use overly recondite and convoluted language, though I suspect the natural home for this is really the yet-to-be-announced Pip and Jane Baker Sourcebook. One notable omission is stats for the Brigadier and Benton, both of whom do appear in this era, but then I suppose they are both available in a number of other products. The inclusion of two sets of stats for K9 Mk 1 and 2 strikes me as taking completism a bit too far, however, and one wonders why Tegan and Nyssa have been included, given their extremely limited presence in fourth Doctor stories. On the other hand, this does tie in with the meat of the book, which is essentially a guide to Seasons 12 through to 18, complete with synopses, notes on continuity, stat blocks for key characters, monsters, and gadgets, and advice on running the TV stories as game scenarios. Cubicle 7 seem to be pitching this series of products to both storygamers and more general Doctor Who fans, but I think it’s more likely to find an audience amongst the former. I’m not yet quite familiar enough with the AITAS rules to judge the accuracy of the stat blocks, but simply as a fan of the show there are a few obvious peculiarities here: no mention of the Zygons’ sting power in their write-up, for instance, while – bizarrely – the Robots of Death statblock repeatedly insists that Vocs are gold-coloured (especially baffling, given that on the same page is a photo of the green-hued robots actually appearing in the story). Easy enough for a competent GM to fix, though. Sort of tying in to this is more stuff which may be of interest to the wider fan community, specifically some enthusiastic – maybe even boisterous – continuity copping. Some of the issues the book addresses seem quite reasonable – just what exactly were the Time Lords doing during the universal near-apocalypse in Logopolis? – whereas some of the others veer off towards the realm of the bonkers. 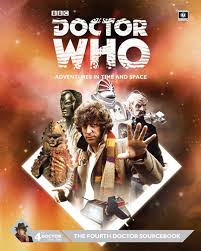 The possibility is offered that the Morbius rebellion may be why every other space-faring civilisation has heard of Gallifrey and the Time Lords, which is not actively nuts (though it sounds like the writer has got non-interventionism mixed up with seclusion), but then the book goes on to posit that the Zygons and the Chameleons are members of the same race, and that the similarity between the Anti-Man (from Planet of Evil) and the Primord mutants (from Inferno) might mean that the Earth’s crust, perhaps even its core, is made of anti-matter (which is why the Daleks tried to steal it). Please, please, enough. Elsewhere I have suggested the limit of the book’s analysis of the fourth Doctor style boils down to ‘be knowingly derivative’ but this is, on reflection, a bit unfair. The tendency for stories to avoid recurring enemies is identified, which is fair enough, along with the observation that the fourth Doctor’s companions were unusually competent, capable individuals (which had never occurred to me before). The real issue that the sourcebook fails to address is that there isn’t a single fourth Doctor style, there are three quite different ones, more-or-less dependent on who the producer was at the time: gothic horror pastiche for seasons 12 to 14, literary space-opera for seasons 15 to 17, and entropic hard SF for season 18. These differences are barely addressed at all. This is quite a flawed product in many ways, and yet I did enjoy reading it a lot, and will probably be checking out some of the other books from Cubicle 7 over the coming months. It bubbles over with an enthusiasm for its subject matter – both Doctor Who and gaming – which is utterly charming, and when a book opens its section on Pyramids of Mars with a heartfelt cry of ‘Oh, what joy!’ you would have to be a considerably harder man than me to be very beastly to it. Probably only really of value to role-playing Doctor Who fans, nevertheless – but then I’ve never really understood why there isn’t more crossover between storygaming and fandom. Maybe this game will help.